Feed speed : 40 m/min. 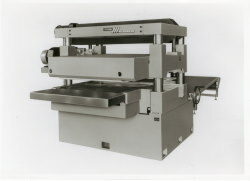 Feature -An unique, four column type slicer for wide material upto 620mm. -Employed turn-table system for variable knife bias angle which can be adjusted according to the material. -Suitable not only for wooden material, but also for plastic and resin. Feed speed : 6 ~ 30m/min. 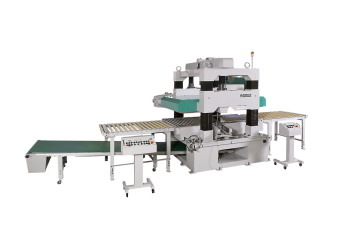 Feature -An unique, four column type slicer for wide material upto 1,050mm. 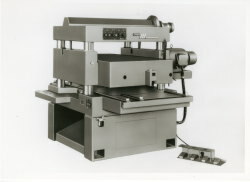 -Specially designed for slicing resin & linoleum. Feed speed : 8 ~ 40 m/min. -Roller table for smooth slicing. -Specially designed for slicing resin & plastic. Send your workpiece to us ! We are pleased to slice it for you. Copyright© 2007 Marunaka Tekkosho Inc., All Rights Reserved.